Hi everyone! I really ment to do a proper post, but it's one of those weeks... So, I thought I would just let you know what's coming up. I haven't been able to blog about the finished jacket yet because I obviously need to photograph it on E. himself. Which means he has to be home and not utterly exhausted and there should still be daylight. That combination hasn't been around this week. 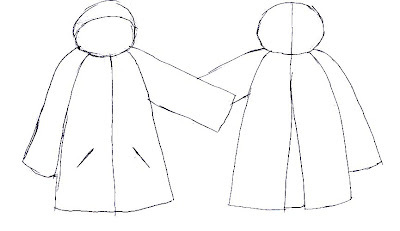 - I want to do a post about my autumn/winter sewing plans but because whatever I'll make will be self-drafted, that means I will have to make some half-way decent sketches first. I don't really need a lot of stuff, but there are many things I want to try. And I want more colour in my wardrobe. - You may have noticed that I've written a few 'discussion'-posts recently. I think I like them. I especially like the insightful comments, so there may be more of those in the future. By the way, several of you mentioned the impact on the environment of synthetic alternatives for fur. You are SO right. In fact, that's what I say to people who claim we shouldn't use real leather. And obviously, Carolyn, I agree that the fact that the animals are also bred for food is a major (moral) difference between leather (and sheepskin) and fur. And I don't think I'll buy a vintage fur myself. Not only can you get really nasty responses from total strangers, I don't think I'd feel comfortable wearing it and I can't stand the smell (judging from that, vintage furs need a LOT of chemical stuff to keep the bugs away. Way more that wool or silk). 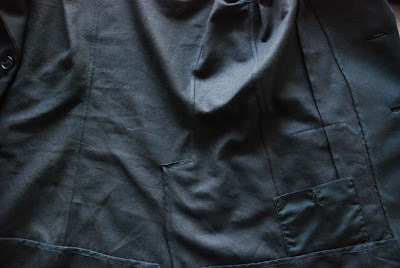 - I'm toying with the idea of having a sew-along which includes light pattern making, so basically, a draft-along. 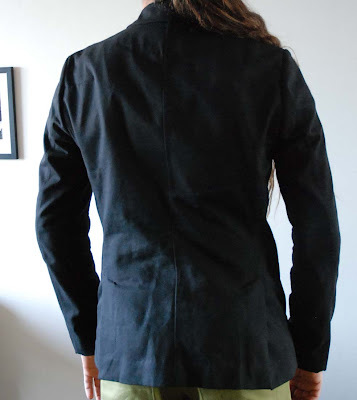 I'm thinking about using the JJ sloper on Burdastyle as a starting point (so anyone can join and there's no fussy sloper drafting needed for people who don't have a personal sloper. Of course I will adress fitting that sloper) and making a 50's or early 60's style dress. If several people are interested, I'll put up possible draft-along designs and try to get the ball rolling on the Burdastyle website. Autumn is closing in. We've had weeks of rain, a warm weekend and every day the weather is surprise. So, typical Dutch weather but there's no denying the change of seasons anymore. This morning before work, I went to the market to pick up fruit and vegetables for this week. I was so early that some stalls were still busy unpacking. However, I did walk back to my bicycle the (slightly) long(er) way, past the second hand stalls. At The Hague's general market, there are three stalls specializing in second hand clothes, and a few general second hand stalls which sometimes have a rack or a pile of clothes (I tend to avoid those). One is the place where I buy my to-be-refashioned leather and silk clothes, another the place where my interesting vintage finds, both clothes and accesoiries, come from and the third is a big two-stall emporium of tacky old party-clothes, shoes, leather and above all, fur. I've never bought anything there. The place with the most interesting vintage stuff also sells some fur in winter. The first two pieces were on the racks now. Seeing this display of seasonal vintage fair begs the question: Is it OK to wear vintage fur? Obviously, there would be the intuitive 'Oh my, I'm wearing dead animals' issue (which seems to bother a lot of people, including myself, much more in the case of fur than in that of leather...). But honestly, that hardly constitutes a rational, moral point of view. Vintage fur isn't quite the same though. In a book I read (I thought the title was 'the importance of sunglasses' but Amazon doesn't recognise that title) there was quite a valid argument against wearing vintage fur. The book was a collection of articles by a prominent British fashion and style journalist. And she was opposed to the wearing of fur, period. First of all, she thought the 'the animals were not killed to dress me but someone years ago'-argument was a weak and in fact rather silly one. 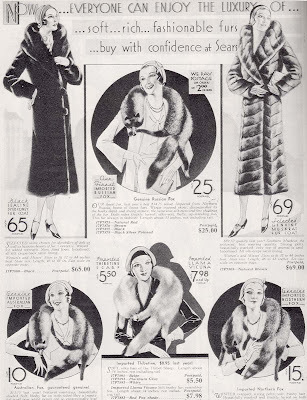 However, her main argument was less a matter of taste or way of reasoning: She stated that by wearing fur, even if it's vintage, you promote the look of it. So, even if you would never buy a coat for which animals were killed recently, you are in a way indirectly justifying the present-day fur trade. Seeing the fur on display this morning (I really should bring a camera to the market some day soon) made me wonder about this. What's your opinion on this sticky issue? This is a pretty bad picture, I know... I just wanted to show you I have actually been doing something. 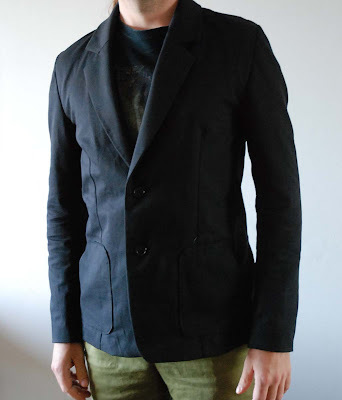 The jacket is now waiting for him anyway because we have yet to decide on a pocket style. 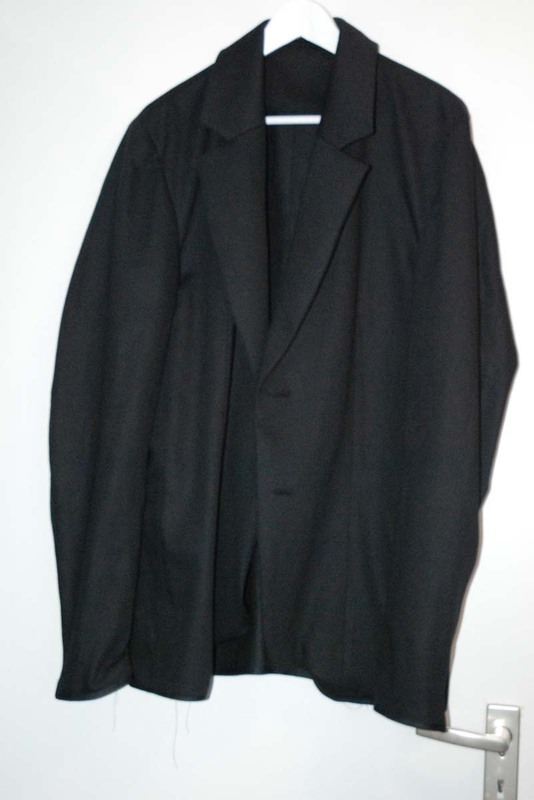 Classic welt pockets are not an option because the jacket is unlined. I considered Carolyn's fancy double pockets but E. has something similar in an old store-bought coat and he doesn't those. And he has that typical men's habit of putting everything in his pockets so whatever kind of pockets he get, they'll have to be functional. 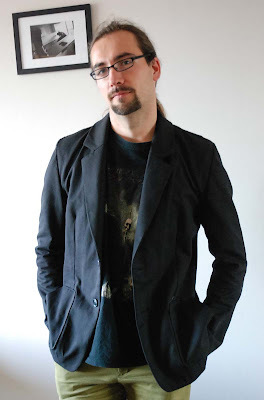 The poor guy is having a madly busy week at work, so I'm not sure when I'll get a chance to let him try the jacket on and discuss pocket options. It's a good thing that better weather is predicted for this weekend, otherwise I'd be worried he wouldn't even get to wear this jacket anymore, this year. P.S. 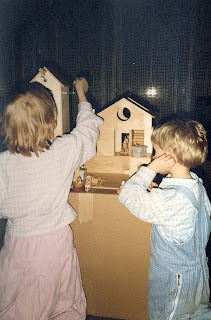 Thank you all for the great comments on my 'retro sewing' post. I've read a lot of very valid arguments. 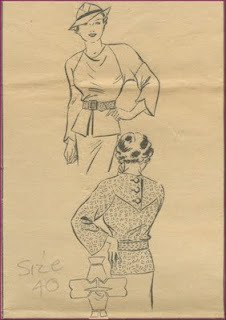 And I had no idea so many of you are drafting patterns as well. This is definately a subject I'll return to. In my garment posts, I use the term 'vintage inspired' quite a lot. And looking at other blogs, I think it's fair to say I'm not the only one. 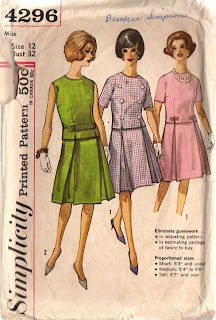 Sewing vintage style clothes (most often dresses), either by using actual vintage patterns, reproductions, modern patterns inspired by vintage style or, like in my case, one's own vintage-inspired patterns, is a big thing in the sewing blogosphere. It's a trend I first encountered a few years ago. I had just started my pattern making lessons and through the beta version of Burdastyle, I first met the sewing community on the world wide web. 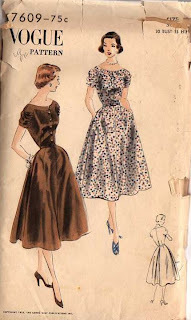 It was through a link on Burdastyle that I came to a dress a day, and as a result, I became fascinated with 1950's dresses. Despite my many creations 'inspired by' I have never sewn with vintage patterns. I haven't even touched the two reproduction patterns I own. Of course, this is partly due to my addiction to making my own patterns. Do that long enough and your mind adepts to it. To me, fitting a purchased pattern to my body now seems awfully labour intensive. I'm very aware it may not even be true, but it just seems more straight-forward to just incorporate the elements I like into a pattern of my own. I know I'm not in a lot of company in this particular habit, so I wonder what others do. Do you seek out vintage patterns for many reasons, and only sew from designs made before you were born, like the amazing Debi and Shelleyj? Do you enjoy vintage style but use patterns both vintage and modern (and sometimes start adding patterns of your own) like Gertie and Peter? 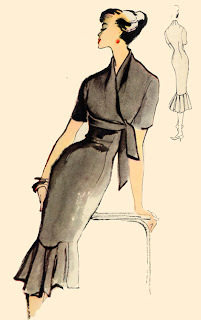 Do you dabble in vintage style sewing occasionally, when the right pattern just happens to come your way? Do you love the look, but it's not for you? Or do you just think this entire vintage-thing is an overrated hype? All the images in this post come from other websites. I've pulled them off as inspiration months, sometimes years ago, so I don't remember where credit is due. 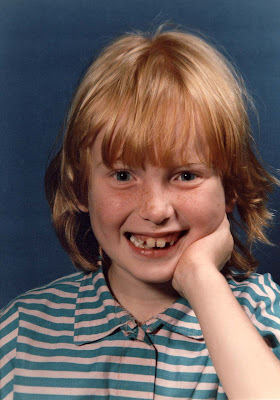 Today, I will show you some very old pictures, of me as a little girl, wearing the clothes my mother made. She enjoyed making my sister and me matching outfits, like these cotton dresses. 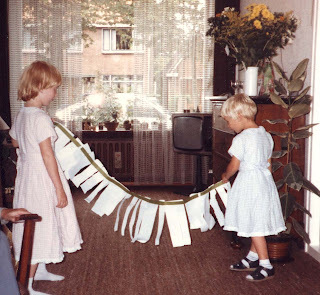 Sometimes, only the fabrics were matched, combined with patterns which suited our personal tastes and activity. My sister was more of a tomboy, so in this particular set, I got culottes, she got dungerees. My (then) baby brother had a matching outfit of a shirt and dungerees in pale yellow. It may seem rather unkind of me to point out a flaw in my mother's sewing. However, I have always loved wearing the things she made for me and I wouldn't have started sewing as easily and naturally if it weren't for her. So, even if I'm not praising every detail of her work, I still love and admire her for it.